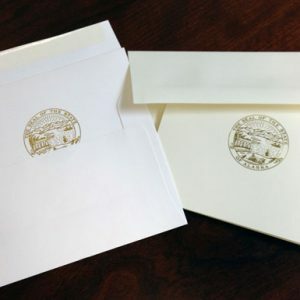 Choose whether you want reflex blue or black ink on your letterhead, and whether the State of Alaska seal is printed in the same ink or displayed with gold foil. For new orders, enter your contact information as you want it to appear. For reorders or updates, upload a scan or photo of your materials with updates marked. 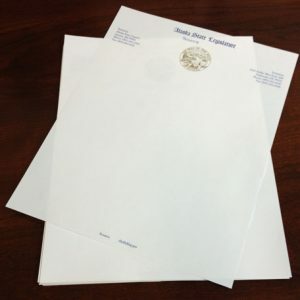 8.5×11-inch letterhead with your choice of reflex blue or black ink. The State of Alaska seal can be printed in the same ink color or displayed with gold foil. Printed on white (Classic Crest Avon Brilliant White Writing) or ivory (Classic Crest Natural White Writing) stock to match your stationery set.